Take photos like never before with the Nintendo 3DS Camera application! The Nintendo 3DS system comes with an inner camera and two outer cameras, allowing for pictures in full 3D. Family portraits will never be the same again! With Nintendo 3DS, you can also capture and view up to 10 full minues of 3D video footage. Budding animators will be pleased to hear that the 3D video capture facility allows you to make your own 3D stop-motion animation videos, too! The 3D capabilities of the cameras allow you to truly enter a new dimension with Augmented Reality, in the AR Games application. 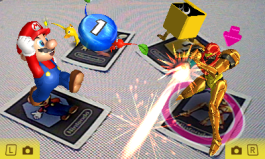 Place one of the provided AR Cards on a flat surface, stand back and watch your game explode into life! Put yourself in the game! Anyone can easily make a personal Mii using the Mii Maker application! 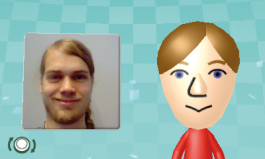 Just take a 2D photo of yourself or someone else and Mii Maker will help you out. Then tweak the colour of hair, eyes and skin and you'll have your own personalised Mii before you know it! Look out for QR Code patterns around our website! Using your Nintendo 3DS system to scan a QR Code will take you instantly to another location, where you can download a demo* or check out game information, for example. Activate the cameras of your Nintendo 3DS system by pressing the L and R Buttons while on the HOME Menu. Touch the QR Code icon found on the bottom left side of the Touch Screen. Note that if you are using the Nintendo 3DS Camera application, you must exit and follow the instructions above. You cannot read the QR Code from this application. To use QR Code patterns, your Nintendo 3DS system must be connected to the internet. If you are experiencing problems reading the QR Code, please check the brightness of your computer monitor.